RM/Sotheby’s results from Hershey this past weekend show that while sports cars have undeniably taken over a large part of the collector car auction market, the traditional big American classics haven’t gone away yet. Their sale on October 7 and 8 at the Hershey Lodge celebrated their 10th Annual sale held during the AACA Eastern Division Fall Meet. Their efforts brought in $11.5 million in sales and an admirable 90% sell-through rate on132 total lots, attracting bidders from 18 different countries. 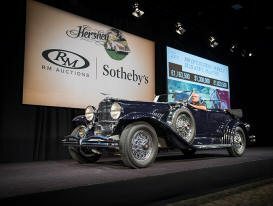 The sale was certainly fueled by a series of rare Full Classic cars coming out of long-term ownership, including a spectacular 1930 Duesenberg Model J Dual-Cowl Phaeton that was the star attraction of the two-evening sale. One of only three original Murphy Dual-Cowl Phaetons, the Duesenberg was retrieved from a storage building at the Mexico City airport in 1962, and offered from 54 years in single-family ownership. Hotly contested by bidders in the room and on the phones, the Model J realized a strong $2,090,000. One of America’s blue-chip classic marques, this handsome 1930 Duesenberg Model J Dual Cowl Phaeton was the high-dollar lot of the entire sale. 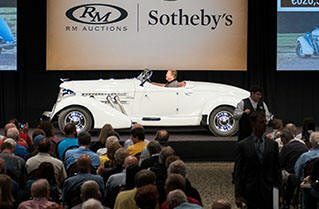 Lot 237, a 1935 Auburn Eight Supercharged Speedster, judged at 100 points by the Classic Car Club of America in 2016 (twice) also stood proud and tall on the podium and sold for $880,000. According to our friends at the Collector Car Market Review, Thursday’s session was headlined by the spectacular 1932 Lincoln Model KB Boattail Speedster. Designed by legendary General Motors stylist, David Holls—earning its nickname, the ‘David Holls Speedster’—the exquisite car represented the Lincoln that ‘never was’. Attracting plenty of admirers during the sale preview, it was the subject of a 10-minute bidding contest, shattering its pre-sale estimate of $200/275,000 at a final hammer of $605,000. Crossing the podium just four lots prior to the Lincoln on Thursday evening, the highly anticipated ‘garage find’ 1957 Porsche 356 A 1600 Speedster also drew tremendous interest from bidders in the room and on the phone. In single-family ownership since 1967, the Porsche emerged from 40 years in storage in a Texas garage just prior to the Hershey sale. Presented in largely original condition, it illustrated the enduring appetite for ‘barn-finds’, soaring past its pre-sale estimate of $200/250,000 to bring a remarkable $341,000. Friday’s session included the sole-surviving 1931 Pierce-Arrow Model 41 LeBaron Convertible Victoria, which sold well at $456,500; and, an exceptionally restored 1958 Chevrolet Impala Convertible exceeded expectations, selling for $161,700 against a pre-sale estimate of $100/125,000. Another highlight and perfectly emblematic of the unique finds at Hershey, a 1925 White Model 15-45, commissioned in period as a Yellowstone Park tour bus, nearly doubled its estimate, realizing $88,000. Our thanks again to Darin Schnabel and the folks at RM/Sothebys for the facts and photos in this report. If you have an antique American car or another collectible you’d like to insure with us, let us show you how we are more than just another collector vehicle insurance company. We want to protect your passion! Click below for an online quote, or give us a call at 800.678.5173.